When Jose Reyes was younger, he was a lock for a ton of stolen bases. Then, in 2009, he started the "always injured" portion of his career - or at least the "fantasy owners are always worried about his injuries" portion. Anyway, while Reyes was in Toronto, he was able to play a little more traditional, American League, "station-to-station" baseball, therefore his stolen base production went way down, making him less valuable in fantasy drafts. Another thing that happened to him in Toronto was that his triples went way down since he was playing in a cookie-cutter-shaped park. But now that he's older and not as fast, hitting a gapper into the giant void in the Colorado outfield may yield more triples and, therefore, more runs scored - and just more energy plugged back into his game overall. The first thing everyone thinks of when a guy goes to play in Colorado is that his Home Run totals will skyrocket. Not likely to be true in the case of Jose Reyes. Like we mentioned above, his triples will certainly go up, and we think that will help to energize his game, overall, offensively. He's also moving back to the National League where baserunners steal more bases, get moved along with sac bunts and sac flies. Because of this, we see Jose Reyes having an excellent season in terms of runs scored. We're still not certain he'll crack 30 stolen bases... in fact, we're not certain he'll crack 20, but we're pretty certain, given he stays healthy, that he'll eclipse 90 Runs scored in a full season. Jose Reyes left a great lineup in Toronto, but he landed in another one in Colorado. This could be the re-start of something great. *Almost no triples in the cookie-cutter-shaped ballpark in Toronto; the move to Colorado (bigger outfield, on grass, corners on the walls) will earn him 10+ triples again, leading to more runs scored; could also raise his batting average a few points. *33 years old, a history of injuries, a move to the NL: it'll be a struggle to stay healthy with no way to hide Reyes as a DH. *Had more walks than strikeouts in his last year in the NL (2012); could be an indicator that he'll show more patience at the plate again. That could lead to a higher batting average, more steals and more runs scored. Another thing Jose Reyes has going for him is that he's on a team with a bunch of hard-nosed gamers. Sure, Carlos Gonzalez tends to battle injuries, but guys like Nolan Arenado, Charlie Blackmon, Corey Dickerson and DJ LeMahieu are just flat-out gamers. The Rockies are on the verge of being the NL's version of the Oakland A's from a two-three years ago: everyone's got a filthy-looking beard, a filthy uniform, diving for everything within their zip code, and getting fired up over everything that happens in their favor. They're a couple pitchers away from surprising the NL West... but I digress. 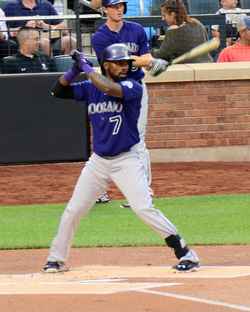 If Jose Reyes gets caught up in the hype of the Colorado dugout, he'll have a fantastic season. He turns 33 in June, so as long as he stays healthy, we expect 90 Runs, 10 HR, 50 RBI, 20-30 SB, and a batting average around .280 in 2016.